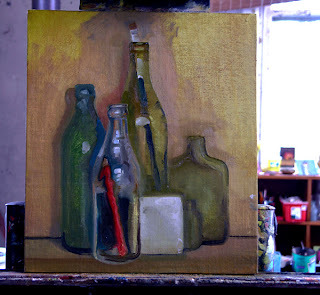 Here is a painting of bottles in it's early stages that I recently started. 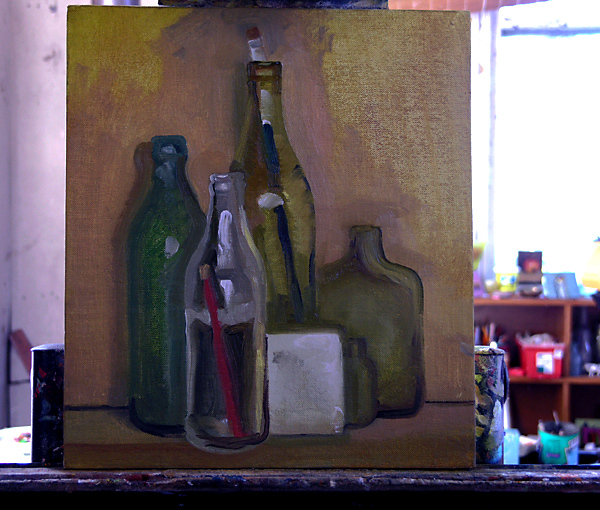 I concentrated on the transparent bottle with the red pencil in to start with, mainly because I was unsure about how to paint it. I find coloured glass much easier and more satisfying to paint. People always ask "how do you paint glass? ", I was pondering this as I painted and decided that painting glass is easy; it's painting the other side of the glass that's tricky. Totally understand about lack of blogging... but keep blogging... occasionally we make time! Have you got a (free) stat counter so you can see where your readers are and how often they drop by? I enjoy your work, great 3D effect coming up with this one. Thank you Kay! Yes I've got a stat counter. 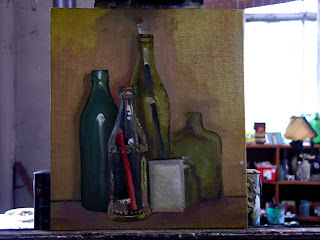 I think I get one or two visiters every day or so on thsi blog, I get a few more on my postcardfrompuniho.blogspot too.